My name is Alicia, I come from a tiny town in the Pacific Northwest, but currently reside in Phoenix, AZ. 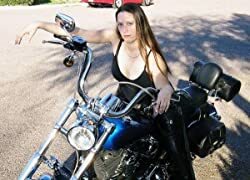 I'm an avid reader of fantasy works, and am a self-published author with a few titles under my belt. When I am not writing or reading, I am riding my motorcycles or playing a good PC MMO. My main genre is Fantasy, but I plan on branching out into espionage/gay romance and military based fiction as well. Please enter your email address and click the Follow button to follow A L Wright!